Dr. Donovan Dagner serves as President of Blue Ridge Equine Clinic. He grew up on a training farm in New Jersey where he gained an appreciation for horses and the people who work with them. 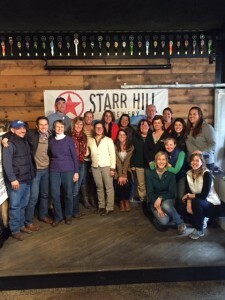 He graduated from the University of Georgia College of Veterinary Medicine in 1995 and completed an internship at Apex Veterinary Hospital in North Carolina before joining Blue Ridge Equine Clinic in 1996. He has served on the Virginia Association of Equine Practitioners board as well as the Virginia Veterinary Medical Association board. His current interests include dentistry and reproductive services, including embryo transfer. He provides these services as well as all routine health care to the clients of Blue Ridge Equine Clinic at their farms as well as at the clinic. His wife Anne is also a veterinarian. They live in Crozet with their daughters, Cecelia and Calla. They all enjoy hiking, camping and any excuse to go to the beach. Dr. Julia Hecking completed her undergraduate studies at Virginia Tech, then received her DVM from the University of Minnesota. After graduation, she completed an equine internship at Blue Ridge Equine Clinic before accepting a position as an associate veterinarian at BREC. She enjoys working on a variety of breeds and disciplines of all different levels. 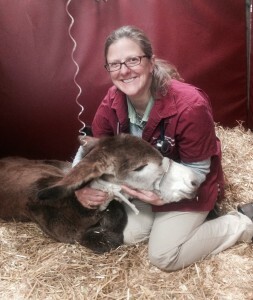 Her special interests include reproductive work, lameness/sports medicine, dentistry and preventative medicine. She is certified in acupuncture and completed her training at the Chi Institute in Florida. She is an FEI veterinarian, a member of the American Association of Equine Practitioners, Vice President of the Virginia Association of Equine Practitioners, and is on the Board of Ride With Pride, a local therapeutic riding program. She is a control veterinarian at many Virginia endurance rides and enjoys presenting for pony club chapters and other equine associations. Blue Ridge Equine Clinic is proud to share Dr. Reynolds Cowles’ profile, published in this month’s Equine Veterinary Education magazine. We wish you the best as President of the American Association of Equine Practitioners and know your leadership will be as valued there as it’s always been here at Blue Ridge Equine Clinic. The doctors and staff spent last Thursday afternoon discussing ways to make every one of our clients’ equine care experiences excellent, every time without exception. We intend that each of our patients, from geriatric pasture pets to horses competing on a national level, will get the best, most cutting edge care available anywhere. When you see one of our veterinarians, you have access to the entire BREC team: nine veterinarians with well over 100 years of combined equine focused expertise, including a board certified surgeon, a board certified internal medicine specialist, certified equine chiropractic, acupuncture and FEI veterinarians. Our veterinarians continuously stay abreast of the latest discoveries in diagnosis, medicine and treatment. They are involved in many equine associations on the national, state and local levels, and regularly consult on cases with each other and with colleagues across the United States. We are always here for you and for your horse. Please let us know whenever we may be of help with any of your equine health care needs. Dr. Tracy Norman, VMD, ACVIM will be available for appointments at the clinic and for farm calls in the Charlottesville area beginning September 30. Dr. Norman will continue to be based in our Valley Division, but will be working at our clinic in Earlysville on Wednesdays and on an as needed basis to serve our clients in central Virginia. Dr. Norman is a boarded Internal Medicine Specialist, in addition to having her doctorate in veterinary medicine. She has dedicated a large part of her career to excellence in diagnostic ultrasound and has been invited by state, regional, and national organizations to teach ultrasound to veterinarians on many occasions. A boarded Internal Medicine Specialist is a veterinarian who specializes in conditions that affect the general health and well- being of her/his patients, including conditions affecting the GI tract, respiratory system, blood and lymphatics, liver, muscles, kidneys and bladder, neurologic system, infectious diseases, and care of neonates (newborn foals). Specialty training in Internal Medicine emphasizes critical thinking, excellent history taking and physical examination skills, and a problem based approach to reaching a diagnosis and appropriate treatment. Board certification in Internal Medicine requires several years of training with specialists, passing multiple examinations, completing research, and publishing at least one peer-reviewed article. Equine Internal Medicine specialists are employed in many diverse fields, including critical care medicine, cardiology, pulmonology, neurology, sports medicine, neonatology, general practice, industry, and academia, to name a few. As always, let us know how we may best serve as a resource for your equine care needs.